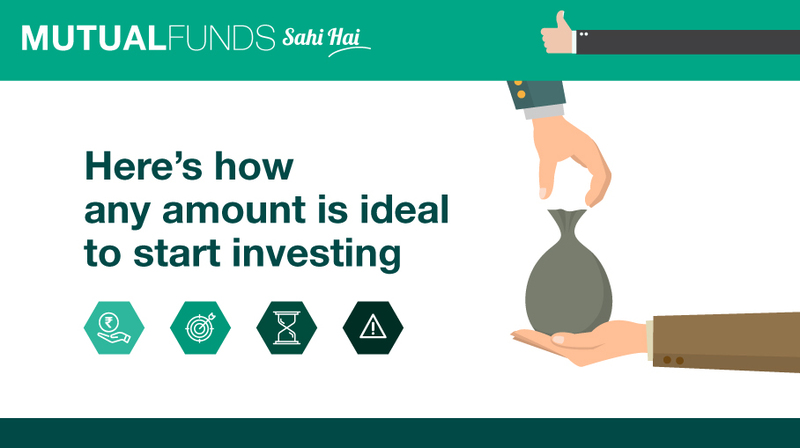 What is the Minimum Amount to Invest in Mutual Funds? Several questions rest in a potential investor’s mind regarding the ideal amount to invest. People consider Mutual Funds as just another investment avenue. Is it really the case? Is a Mutual Fund just another investment avenue like a fixed deposit, debenture or shares of companies? A Mutual Fund is not an investment avenue, but a vehicle to access various investment avenues. Think of it this way. When you go to a restaurant, you have a choice to order a la carte or buffet/thali or a full meal. Compare the full thali or the meal with a Mutual Fund, whereas individual items you order are the stocks, bonds, etc. A thali makes the choice easy, saves time and also some money. The important thing is to start investment early, even if small, and gradually add on to your investments as your earnings increase. This gives you better prospects of better returns in the long run.